Where Is Gold In California? On today’s “Gold In My State,” post we’re going to look at where gold is in California and why it’s there. So let’s take a look at California, as it leans left. Looking along the Sierra Nevada here you can see this pattern where we have gold being injected into the upper crust. We have the same situation that goes along the coastal mountains a little bit, and heavily up in the Klamath mountain ranges that joins up into the Cascade’s. What you want to know is how these things interact, specifically how the Pacific Plate riding under the continental crust causes gold to concentrate in veins and injects more gold into lode. That gold lode erodes and comes down the Sierra Nevada placer deposits and out onto the desert playa’s and so forth. 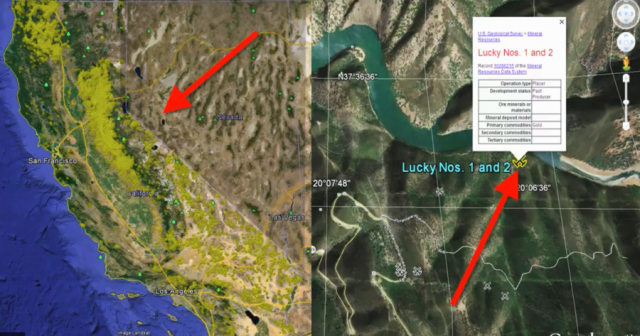 These are areas that you want to focus on when you’re looking at California gold. There is the mother lode region, and then there’s this additional Klamath region which is high in platinum, and other things that are interesting. You want to pay attention to those areas as you’re looking for gold. Not to leave out the coastal ranges along here, which are also rich in various minerals, primarily oil, but you can see a lot of minerals, especially down in San Diego that are related to gold. You can also find a lot of interesting stuff even some early placer mines that were found in the Santa Clarita – Valencia area. This is important because really where you go in California, it’s hard not to go out to a place that can present you with a gold opportunity. The riches are not the same as they are along the Mother Lode, but they are there. And so it’s worthy of note that pretty much anywhere along in California because of the subduction zone effect. There is stuff going on here that will reveal gold. 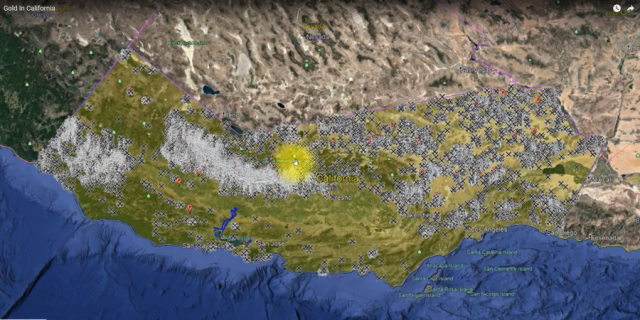 And the faulting that goes on is part of that picture, the San Andreas coming all the way up from Baja up through San Francisco and heading out to sea, the cross plate interactions that go off shore that affect the onshore production of gold and volcanoes which are connected. So anyway, it’s worthy of note to pay attention to all these different zones. But let’s take a look at just how much gold there is in the state of California. This is a picture of where deposits have been found in the past, or that are currently being mined throughout the state of California. As you can see, there’s this huge band around the Sierra Nevada mountains, and then there’s this huge chunk up, the Klamath range, but as you can also tell, southern California has it’s fair share of gold distributed throughout the area, and there’s a small amount distributed along the full range of the coastal mountains as well. The only area where gold really doesn’t show up much is down the central valley, which makes sense because you know this is a three mile thick chunk of sedimentary deposits. Now to the eastern side though, there are placer deposits, that go down and were mined by using bucket dredges in the 1800’s, all the way up through 1950 or so. So it’s important to understand that gold is where you find it, and the state of California is loaded with the stuff. Prospector, Jess — Over and out. P.S. If you want to know more about how and where to find gold and make these gold maps you can check out our Government Gold Maps here.